As most of us already know from the many previews these T-34 kits are basically shrunken versions of the big Trumpeter 1:16 T-34 kits released a while back which makes for very impressive looking kits in the smaller 1:48. Some areas have obviously been simplified for the smaller size and there is no etched parts apart from the screen on the engine cover door plus a section of brass wire for the tow cable. 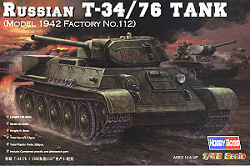 We will have a closer look at three of the T-34 kits here as many of the parts are shared between the kits, the two T-34-76s, Model 1942 (kit #84806) and Model 1943 (kit #84808) plus one of the T-34-85 model 1944 (kit #84807), there is also a fourth T-34-85 model 1944 (kit #84809) available but as this has only minor differences from kit #84807 it’s not included here. This represents a T-34-76 Model 1941 and more specifically a vehicle produced by Factory 112 “Zavod” in the spring-autumn 1942 batch with all the characteristic features of that production batch such as cast turret with PT-K periscope and late style ventilator, armoured cover on the hull machine gun and added protection ribs for the turret base, handrails added to the glacis, hull side, engine deck and on the turret, all steel idler wheels but with the early rubber rimmed road wheels plus the square additional fuel tanks. 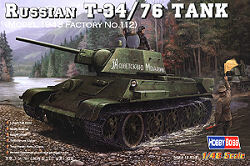 The kit represents a T-34 Model 1944 with the larger redesigned -85 turret as well as square front fenders, later style ‘spider web’ rubber rimmed wheels and cylindrical fuel tanks on the rear hull and side panels. 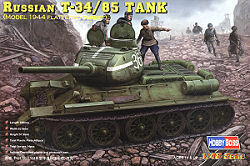 The kit represents a T-34 Model 1943 (autumn-winter 1942 batch) with hexagonal hard edged turret and standard F-34 gun mantlet and the two early round “mickey mouse” hatches plus the square box fuel tanks on the rear hull with the suspension having the combination of three all-steel road wheels with pierced rubber rimmed ‘spider web’ road wheels on the first and fifth station. The standard of moulding on all kits is quite good with nice crisp details and includes some weld seams and bolt head details but there is quite a bit of flash and excessive mould seam lines about the place plus some pin ejector marks. Many of these are in places where they can't be seen but there are some visible that can't be avoided but should be fairly easy to remove and there is some mould release agent still on a few parts that will need to be given a detergent bath before assembly. The suspension has separate axles with large fixed plastic springs that fit into the large hull side channels which also have internal hull details such as ammo racks and small fittings. The axles are designed to be glued in place through the hull openings but can easily be repositioned for animating the suspension if you wish. 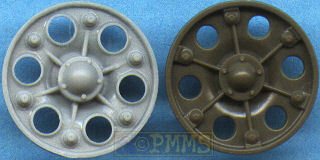 The early bolted dished wheels with perforated rubber rimmed wheels are nicely detailed and have the hub included with the outer wheel with the two wheels discs simply glued together and then attached to the axles. With the hub moulded on and not separate as with the other wheels means the slight undercut around the hub cap is not included but this may not be that noticeable. 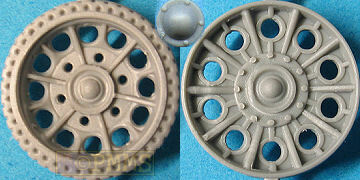 It should be noted there are different designs of the solid dished wheels with varying contours and bolt head spacings and the wheels in this kit and in the Tamiya T-34 kits depict these variations and so both are basically correct for the type of wheel depicted. 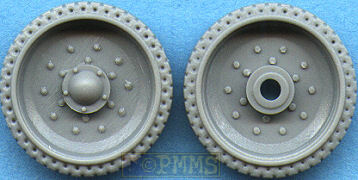 The all steel road wheels have inner and outer wheels and separate centre hub cap and feature nice ribbing on the wheel faces but are a little chunky in places with the pierced rubber rimmed road wheels on stations one and five again have good ribbing and rubber section details but some of the smaller holes needed to be drilled out to fully open up on all the wheels. This has all later ‘spider web’ ribbed wheels with solid ribbed rubber sections and again has separate wheel hubs for better definition, quite a few of the smaller inner holes had to be drilled out completely for a better appearance. There is quite a large moulding seam around the rubber section and some of the ribbing is removed as you clean this up but otherwise are nicely done. The two part drive sprockets have very nice details including the six open holes with the raised lip and no small bracket around the outer six bolts which appears to be an early sprocket design (1940/41) with later sprockets having the bolt bracket. The two part idler wheels have the centre hub detail a little flat and it should be more rounded but both these details are in the minor category as there is little you can do other than replace the wheels. Both the drive and idler wheels are designed to be glued to the respective axles with the final drive housing having good bolt head details included. The lower hull tub has excellent detail on the side walls, undersides and interior floor with the outside track pin retaining bulge on the rear hull plus the separate crew escape hatch and lower rear hull panel that includes the final drive bulges with the fit to the hull tub being very good. The 550mm ‘waffle' pattern tracks are in link and length plastic with nice details and include large jigs that allow you to glue together the sections of track around the drive sprockets and idlers before hand and then fit the assembled section over the wheels and these make the job really easy and are a nice inclusion. On the tracks links there are small pin marks on the outer edges but these is quite shallow on my tracks as can be seen in the image and doesn't mar any of the raised detail and the inside faces are very clean without any blemishes. This area is very complete with the details already added to the suspension channels bulkheads as well as a very busy side panel next to the driver. The front suspension channels are slanted at slightly different angles as they should be although this is not that apparent in the smaller scale but the feature is included. The Driver's and Gunner/Wireless Operator's stations include multi-part part seats, foot pedals and gear levers as well as the radio, electrical junction boxes on the sidewalls. At the rear of the compartment are the large batteries and engine compartment bulkhead plus machine gun and 76.2mm ammo racks while on the inside of the upper hull is additional ammo racks and the coaxial machine gun mounting and 7.62mm MG plus the driver’s hatch piston and instrument panel. There are variations if the interior floor ammo box arrangements and other minor differences between the -76 and -85 models as there should be. This is again very busy like the big 1:16 kits with the engine block with separate lower casing and upper cylinder banks with separate exhaust manifolds plus additional accessories with excellent fine details but there is a bit of minor flash to be removed about the place. The gearbox and brake assemblies has nine parts with the rear four part fan assembly that fits between the gearbox and central bulkhead with two large air cleaners with four parts each plus the two large side mounted radiators and separate exhaust pipes running each side of the compartment for a very busy engine compartment. As with the bigger kits much of this detail is hidden when you fit the upper hull but if you leave some of the hatches and access panels off this will be more visible. The upper hulls are moulded in one large piece with separate engine bay doors and side intake panels as well as separate real hull panel which also has the circular engine inspection panel separate. There are minor detail differences between the -76 model 42 and model 43 hulls with the model 42 having the armour ribs added around the turret base and the stepped join on the glacis/side panel join while the model 43 hull doesn’t have the turret ribs and the glacis/side panel join is a flat continuos join as well as the different arrangements of the grab rails. The -85 hull has the squared front fenders with hull fillets plus the turret ring is larger as it should be as well as minor differences to the side engine covers with all these minor changes showing good attention to detail. At the front there is the driver's hatch with six parts which include inner and outer door panels, separate periscopes and armoured covers plus separate latches and fittings and can be fitted in the open or closed position. On the engine deck there are the inner detail and movable louvers on the rear and side intake openings with the separate left and right intake covers having excellent grill work details although these are moulded solid hiding the inside details while the rear panel has etched intake screens included with the plastic part which looks impressive but the mesh is actually way oversized and causes a bit of distortion of the plastic panel. I actually relaced this with the fine etched mesh and framework for the Hauler set #48035 for a finer look but there will no doubt be sets released specifically for these Hobby Boss kits from the likes of ABER, Hauler and Voyager. The intake cover for the -85 has slightly different rear details which have been included so don’t mix these up if you have both the -76 and -85 kits. On the rear hull panel is the separate exhaust shrouds and exhaust pipes plus the circular access panel as mentioned but some minor trimming may be needed when fitting the rear panel to the hull. The two -76 kits have the later square fuel tanks mounted on the rear panel while the -85 kit has the two cylindrical style rear plate tanks and rear hull side mounted fuel tanks. Additional details include the many small tie down cleats, fender storage boxes, track ice cleat racks and spare track links, plus the aerial mounting and tow rope from the copper wire included. The upper and lower hulls fit together with the aid of six locating pins along the sides that ensure precise location and include the sponson filler panels while the angles of the glacis and side hull appear within acceptable tolerances when compared to available plans. The main turret is in two halves with a separate roof, large roof hatch and lower turret ring. The F-34 76.2mm gun and mounting has numerous parts with everything from the separate breech block, breech opening level and trigger mechanism, sighting telescope with traverse wheel as well as the coaxial 7.62 MG and crew seats attached to the turret ring. The exterior has the 76.2 gun with hollowed out muzzle and a one piece mantlet that does have a fairly large central mould seam as a result that will need cleaning off. 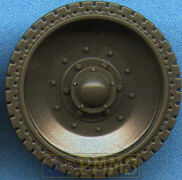 It should be noted that this particular turret doesn’t have the separate flat panel at the back as with the Tamiya T-34 turret but this is correct for the version depicted in this kit and offers a nice alternative to the Tamiya kit but there is no cast texture on the surface which can easily be added with “Mr Surfacer” of similar. Comparing the barrel length to the reduced 1:35 plans in the Model Fan Encyclopaedia #5 T-34-Stalin's War Horse and Modelist Konstruktor Medium Tank T-34 see it just over 2.5mm too long, the actual exposed 1:48 barrel length along the top measurement should be 36.8mm. The turret ring actually fits into slots around the bottom of the two turret halves and you have to fit this as you join the halves together as it can’t be done afterwards. The fit was a little tight and reducing the outer diameter of the ring fractionally made for a better fit. The fit of the roof to the turret shell also needed a little trimming and the openings for the roof ventilator are way over sized and it is also located centrally when it should actually be lightly offset to the right but the separate lifting eyes are not bad for the small scale. The main turret is in two parts, the upper turret shell and lower section with turret ring details, there are some largish pin marks around the upper ring and care will be needed in cleaning these up to not damage the surrounding bolt head details. Added to the turret ring is the traverse gear, seats and rear shelf MG magazine racks with detail on the inside of the turret shell that is all but invisible after assembly, but you know it’s there. The F-34 76.2mm gun and mounting has numerous parts with everything from the separate breech block, breech opening level and trigger mechanism, sighting telescope with full basket panels and traverse wheel as well as the coaxial 7.62 MG and the two four part crew seats attached to the turret ring. The gun assembly fits neatly into the large front bulged mantlet that has nice cast details included while the outer mantlet has bice bolt head details but there is a prominent seam line down the centre that is easy to cleanup and the 76.2 gun has hollowed out muzzle. There is no cast texture on the surface which can easily be added with “Mr Surfacer” of similar. On the outside is the two round turret hatches but there are some pin marks on the inside of the hatches to clean up if you are to show them open and the three lifting eyes and side grab handles are also included. The large turret has the upper shell and separate lower section that includes the turret ring, a separate Commander’s cupola with separate periscopes and the Loader’s hatch is also separate. The casting marks on the outside are nicely done but there is no cast texture on the surface which can easily be added with “Mr Surfacer” of similar. There is detail on the inside of the turret shell such as the rear ventilators and some wiring which again can’t be seen after assemble but it’s nice to be included. The full interior has the 85mm gun and mounting in multiple parts with traverse gear, radio, co-ax MG and seats around the ring with the 85mm ammo racks on the side walls and rear bustle. The gun barrel is hollowed out and the mantlet nicely rendered and a separate upper cover piece over the mantlet which could be thinned down a little for a better look. All the turrets simply sit into the hull turret rings so you have to be careful when handling the completed kit so the turret doesn’t fly off if you turn the model upside down. These are in the form of a large foldout sheet with clear exploded view drawings of the various sub assemblies but due to the sheer number of parts you will have to study the instructions carefully to ensure you get the right part in the right place and in the right sequence in some areas. 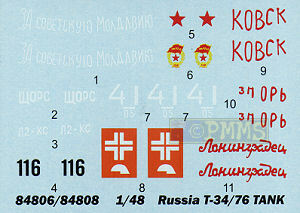 The decal sheets are nicely printed with very thin carrier film but strangely the same sheet in included in both the -76 kits and another similar sheet in both the -85 kits which means some of the markings are not applicable to one of the models and references will be needed if you want to get the right markings with the right vehicle. 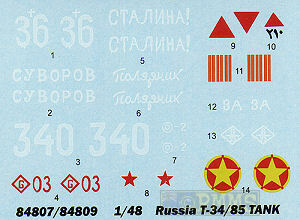 A separate colour markings sheet is included with each kit giving generic decal placements but no unit information is given so again other references will come in handy. Just as the big 1:16 Trumpeter kits were impressive, these are even more so given the smaller scale with finely rendered details everywhere, the level of interior detail as well as the exterior detailing is superb making for a very detailed model straight from the box but the fine detail is offset a little by the amount of flash and cleanup as a consequence of the fine detail on such small parts. The subtle changes between the hull details for the particular versions is noteworthy and as mentioned above including details different from the Tamiya kits is good as it offers a wider choice for the modeller. These kits have raised the bar for 1:48 armour kits and it will be hard to see the level reached again but if it were not for the 1:16 Trumpeter kits I doubt we would have seen this detail included and I also doubt it will become the norm as we have seen from the other Sherman Hobby Boss releases which just have the usual exterior details of contemporary 1:48 kits. Kits courtesy of my Credit Card and the excellent service from Rainbow Ten. Hobby Boss is distributed in Australia by J.B.Wholesalers.